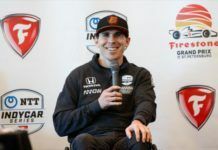 -Group 1: Graham Rahal, Scott Dixon, Will Power, Takuma Sato, Dario Franchitti, Oriol Servia, James Hinchcliffe, Ryan Hunter-Reay, Sebastian Saavedra, James Jakes, Simona de Silvestro and Stefan Wilson (who makes debut on this event). 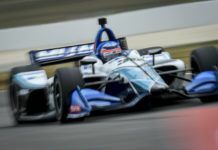 -Group 2: Tristan Vautier, Josef Newgarden, Simon Pagenaud, Tony Kanaan, Sebastien Bourdais, Luca Filippi, Helio Castroneves, EJ Viso, Justin Wilson, Charlie Kimball, Marco Andretti and Ed Carpenter. The first group was the most competitive. The fastest driver in this group was Scott Dixon. Eliminated were: James Jakes, Dario Franchitti, Oriol Servia, Simona de Silvestro, Sebastian Saavedra and Stefan Wilson. 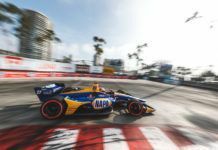 The second group was much less competitive, and there was a red flag due to a track inspection after an accident by Sebastien Bourdais, furthermore, EJ Viso had an incident on the chicane, causing a local yellow and making things difficult for the other drivers. The fastest driver has been Simon Pagenaud, followed by Tristan Vautier (a French one-two). 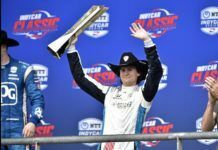 Eliminated were Luca Filippi, Tony Kanaan, Marco Andretti, Ed Carpenter, EJ Viso and Sebastien Bourdais, who has complained about the difficult chicane. The second round was over early, due to an incident with Graham Rahal and Tristan Vautier at the exit of the pit lane. Both were on top 6, but Rahal lost his two best times for causing the collision. 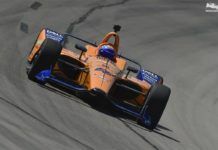 Scott Dixon and Helio Castroneves were out of the fast six, but the penalty let Scott Dixon in. 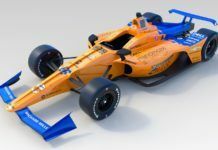 Eliminated were Helio Castroneves, Ryan Hunter-Reay, Charlie Kimball, Takuma Sato, James Hinchcliffe and Graham Rahal. The final round has been a fight between Scott Dixon and Will Power, finally the New Zealander has taken P1 on his final lap. Simon Pagenaud has been third, Justin Wilson fourth, Josef Newgarden fifth and Tristan Vautier sixth.